I don't know what's happening to my country. We Brazilians were always considered a kind people, a warm people, a gentle people. I don't know if that was just a myth and the Internet just showed the true colors of everybody. Or maybe the radicalization promoted by the right-wing news media in the last 12 years finally paid off and they're actually managing to turn us into a country full of hate and venom. The so-called conservative "values" usually come with economically conservative policies - and it just makes sense for the media to promote them in order to fortify the kind of thinking that always benefit the huge corporations. It's not a coincidence that the same people that always talk about "family values" frequently defend the death penalty, attack the gay community and talk about how wonderful "free market" is. Two days ago, the police killed Eduardo, a 10 year old boy in a Brazilian favela located at the Alemão's Complex in Rio de Janeiro. The kid was doing nothing. He was sitting around. His mother was a couple feet away from him. There's video of the seconds just after the killing - I didn't watch it (I hate these types of things; I can't understand why people share and watch them), but I read people saying the mother can be seen screaming and crying and telling the cop to also kill her because he had already destroyed her life. Oh, god. One day later, the son of the governor of our wealthiest state (also our "rightest" state and the main opposition to our leftist federal government) died in an helicopter crash. Now guess which of those tragic deaths got all the media's attention? And guess who was completely forgotten? Now, that's not to say the young man's death wasn't a tragedy, because it was. I disagree with his father's politics, but my first attitude after hearing the news was to publicly pay my respects to his family. Parents shouldn't have to bury their children. What I'm saying is that it's just plain wrong for the media to treat one death as a national tragedy and the other one as a footnote. It's perfectly possible to be a decent human being and feel sorry for all the families involved - but, as citizens, the child's death should be considered not "merely" a fatality, but also an incredibly important national issue to discuss. So I decided to write a small text about the child. (I'll reprint the translation below.) If someone had told me that someday I'd be insulted for writing a text lamenting the execution of a child, I'd never believe them. But that's what's happened. A LOT of people said I was "victimizing" the child (what? ), that police officers are killed every day while defending us and that I only wrote about the child in order to "spite" the governor who had lost his son. Who are these people? They even started sharing the picture of another boy carrying guns and identifying him as the kid who had been killed. Now, EVEN if it was him, that wouldn't justify the killing. But it wasn't him. And so those people were killing Eduardo for a second time by blemishing his memory as a way to further their political agenda. Which political agenda? They're trying to lower the age of criminal responsibility from 18 to 16 years old - as if putting more youth in prison would be the answer for all our problems when, in fact, the statistics show that from all our teen population, just 0.5% of them committed crimes. On the other hand, the World Health Organization says Brazil is in 4th place amongst 92 nations when it comes to teenagers being killed. We should be protecting our youth, not finding ways to put them in jail. Sometimes, I feel I'm without hope. Sometimes, I feel this is not the country I love so dearly. Sometimes, I feel we've lost it. Anyway. The text below is the one I published at my public FB page. Eduardo was 10 years old. Eduardo had parents, siblings and friends. Eduardo enjoyed running, playing, watching TV, laughing at cartoons and eating candy just before lunch. Eduardo wanted to be a firefighter when he was a grown-up. But Eduardo will never grow up. He started the day as a child and ended it as a corpse. He had dreams and now he’s wounded and lifeless meat. His verbs are now in the past. He dreamt. He laughed. He played. He lived. Eduardo was executed by a member of the Brazilian military police at the Alemao’s Complex in Rio de Janeiro. His death was not the main story of web portals, newspapers and TV news. When his death was informed by the news, he became just “a boy of Alemao’s Complex”, a statistic of violence. Eduardo had no chances when he was born and with no chances he died. Maybe Eduardo was afraid of the dark. Of monsters. Of thunder. Maybe. However, he probably was afraid of the police. As he should be. If I was poor and lived in a favela, I would be too – because I would know that, for a good portion of society and for many “officers of the Law”, I wouldn’t be just a child; I would be a criminal waiting for my first crime. 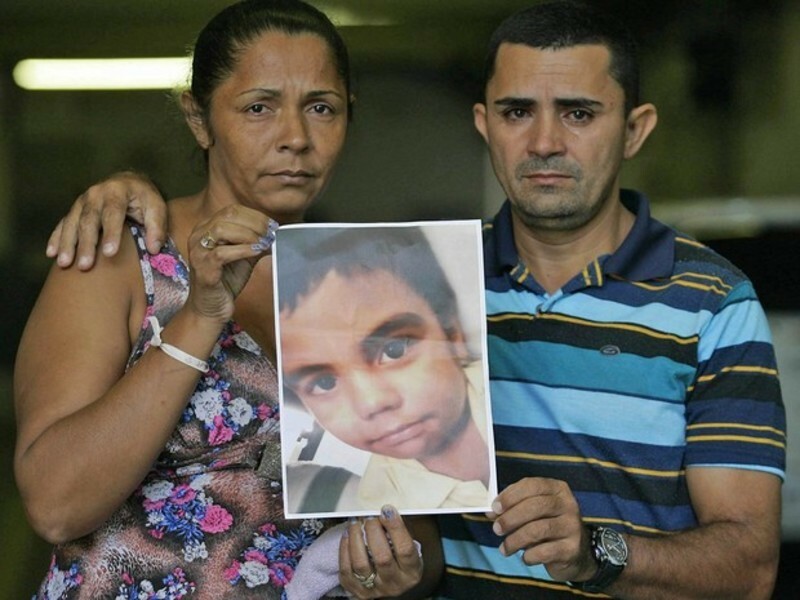 Eduardo had his young head destroyed by the bullet of a police officer. And on the websites that announced his death without any hint of protest, the comments were filled with sarcasm and people saying that, if they could, they would help the police to kill 50 more people every day. And then they screamed for the reduction of the age in which a minor would become legally a criminal – in a country that already condemns 10 year-olds to death. You’re dead, Eduardo, and I have to go hug my children really tight now while I think about how your mother is hurting. A mother whose arms will forever miss the heat of your little child’s body. Forgive this world, Eduardo. Forgive this world.